Home » Latest Cancer News » Committed To Finding.. In this month’s newsletter we summarise some of the points of difference that make SPDT 4 LIFE stand out in the pack of cancer treatment centres around the world and we introduce you to Juliet a recent patient at Golden Sand Bay Hospital. The list of differences between us and other oncology centres is extensive and we are both excited and proud that the programs we are developing will be able to provide a range of treatments and a level of care like no other, that patients the world over have been begging for. We invite all those who have been touched by cancer and are seeking treatment for themselves, or another, to contact us and learn more about our holistic treatment programs. We have had great success with helping many patients who have been given no hope elsewhere and look forward to helping many others on their journey back to optimal health. Born out of a vision to build the world’s best holistic cancer treatment centre, SPDT 4 LIFE is revolutionising the way cancer is being treated. Having observed the gaps and failings in the system and acknowledging that there are certainly many ways that things could be done better, we are committed to doing things differently to the ‘one size fits all’ way that cancer has traditionally been treated. Listening to the needs of cancer patients and working with world leading experts in their fields, we have created a holistic cancer treatment centre like no other. Patients from all over the world have travelled to SPDT 4 LIFE seeking treatment after their doctors in their home countries have told them that there is nothing that can be done for them. 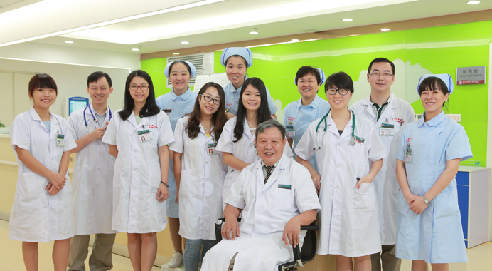 Here renowned oncologist Professor Wang and his dedicated team leave no stone unturned when fighting for their patient’s lives, earning them the illustrious reputation of being able to help patients who have been given no hope elsewhere. Range of treatments – The range of holistic, alternative and traditional cancer therapies we offer is unparalleled. Our ongoing commitment to staying up to date with the latest research and findings in the fields of cancer and general health – so as to provide our patients with the safest, evidence- based, non-toxic treatments available – has lead us to work with some of the world’s leading authorities in their fields and enables us to expand our treatment options. If there is a new discovery that can help our patients, we want to know about it! This attitude ensures that we are a leader in our field and second to none. World-class hospital facilities – Being set in a world-class hospital with internationally acclaimed specialty departments, provides our VIP patients priority access to advanced diagnostic equipment and the full support of the hospital’s other departments. Any test or procedure our patients need, can all be done on site. Highly personalised treatment protocols – At SPDT 4 LIFE we put a higher priority on personalised treatment than most oncology departments. Everything from cancer sensitivity, to gut microbiome – and everything in between – is analysed by our cutting-edge genetic testing and used to create an individualised treatment protocol unique to each patient. Every aspect of a patient’s treatment – medication, food, exercise, supplements etc is personalised. No two patients – or their cancers – are the same, so no two treatment protocols should ever be the same. Outstanding team of doctors – Our experienced team of oncologists have a broad range of knowledge in specialised fields such as SPDT. Lead by their open-minded mentor Professor Wang, they are always researching the latest journals and papers to ensure their patients are given the best possible treatment. 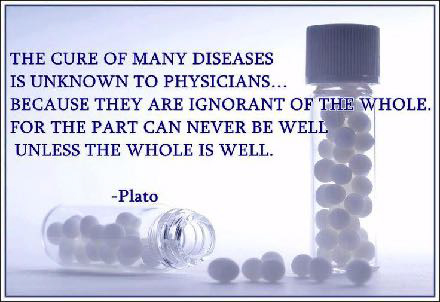 Everything must be evidence-based and the safety and wellbeing of their patients is paramount at all times. These highly qualified professionals manage every aspect of their patient’s personalised care. Dr Wang with some of the SPDT 4 LIFE team of doctors, nurses and interpreters. Focus on returning patients to optimal health – Treating a patient’s cancer is not the only focus of our treatment. We also focus on identifying and correcting other underlying health issues that may have contributed to, or encouraged cancer growth. Cancer does not occur in isolation, all functions of the body are connected. We look at diet, gut health, exercise, stress levels, sleep, exposure to toxins, critical vitamin levels – such as Vitamin D – and so much more. By correcting the other health issues we aim to return the patient to optimal health, with a strong immune system that can focus on fighting cancer. Education – Our motto of Educate, Eliminate, Rejuvenate, stems from our strongly held belief that knowledge is power. Often a lack of knowledge and resulting bad habits, can contribute to cancer. Experts say that the majority of cancers these days are lifestyle induced and preventable. Smoking, drinking alcohol, poor diet, sedentary lifestyle, lack of exercise, stress and exposure to toxins, can all cause cancer. Replacing cancer-enhancing habits with cancer-fighting ones and educating our patients as to what is a truly healthy lifestyle, is part of our unique strategy. Each patient will receive “The SPDT 4 LIFE Manual “, which they can use as a resource when they are in the hospital and when they return home, to keep them on track. We EDUCATE our patients on what they should and should not be doing, we ELIMINATE the cancer and the cancer enhancing elements from their life and then REJUVENATE the body through newly learned behaviours and building a strong immune system that is designed to stave off cancer recurrence. It is important to not just blindly treat the patients, but to explain to them what we are doing and why we are doing it. Give a man a fish you feed him for a day, teach a man to fish you feed him for a lifetime. Patient understanding and co-operation is critical to the success of their treatment. Patient Advocate Network – This is a world first initiative being developed by SPDT 4 LIFE to provide on- going guidance and support to our patients. It involves working with our international network of allied health professionals and support staff, to ensure that patients get the best level of care possible when they return home and stay on track with the protocols prescribed by Dr Wang and his team. Resources will include, the manual, our website and an app. Family Support – This is another unique initiative from the team at SPDT 4 LIFE, further demonstrating the point that we are a cancer treatment centre like no other and revolutionising the way cancer is being treated. A cancer diagnosis in the family can have considerable impact on family members and friends – and in more ways than one. We provide a ‘support pack’ to educate and assist our patients families at this difficult time. Information involves counselling, recommended testing for their own early cancer detection and a manual to educate them on best practices to prevent and fight cancer – both for themselves and so as they can better support their loved one. Accommodation & Facilities – What is most important is that our patients get the absolute best care possible, but at the same time we also want to make sure that they are as comfortable and happy as they can be during their stay with us. To that end, we take great care to make sure that we can provide as many comforts of home as possible. Our spacious rooms have queen size beds, instead of regular hospital beds. They also have large flat-screen TVs, a fridge, desk, closet, table & chairs, etc. Our rooms are more like a hotel room than a typical hospital room. Carers Welcome – Another great point of difference is that we welcome and encourage family or friends to stay in the hospital with patients. Travelling to an unfamiliar country and being away from home for an extended period of time, could be daunting and lonely if you had to do it alone. Which is why we have made accommodations for a carer/s to stay with patients during their treatment. The rooms are generous in size, so there is plenty of space for a companion, if patients choose to bring one. SPDT 4 LIFE Patient Welfare Program – We also want patients to be in a positive frame of mind and to be happy, as this is beneficial to their treatment outcomes. So we are conscious of fostering a fun, up- beat atmosphere through our regular parties, events and excursions. Again, this is not like any other hospital you have ever seen. Travel Agency – Organising flights, passports, visas, currency and all the other required elements for a trip to SPDT 4 LIFE can be overwhelming for some people, at a time when they already have enough to worry about. In an effort to ease the burden and make life easier for patients and their families, we have partnered with an award winning travel agency ‘helloworld Rowville’ to assist patients and their families with anything they may require for their trip to China. Strive to do better/Feedback – We refuse to rest on our laurels. The SPDT 4 LIFE team are constantly striving to do the best for our patients. Whether it be staying up to date with the latest research and findings in order to provide more treatment options, or improving the rooms so as they are more comfortable, we will always endeavour to do better. We conduct regular patient surveys to gather feedback that we can use to improve our service. SPDT 4 LIFE is proud to be able to take the lead and provide this revolutionary approach to cancer and overall health care for patients that so desperately need it. We will continue to listen to the needs of patients and build for them the best cancer treatment facilities available anywhere. Our team has plans to open more SPDT 4 LIFE centres in other locations around the globe and in doing so we look forward to being able to help many more patients live long happy, healthy and fulfilled lives. It’s a battle she has fought for 25 years so far but Juliet has no plans to give up anytime soon. It has been a long a difficult road that has taken her to far off lands to receive varied types of treatment but Juliet continues to fight on with a positive attitude and the heart and mind of a warrior. “My family carries the BRCA2 gene – my grandmother, mother, aunt and niece – all suffered from breast cancer and sadly passed away. Unfortunately, I too carry the gene and have developed the disease. But compared to my family who all suffered negative side-effects of chemotherapy before they died I am considered to have been quite lucky,” explains Juliet. In 1992, Juliet was diagnosed with cancer in the right breast, then in 2013, lesions developed in the left breast which then metastasised. During the years spanning 2013 to 2017, Juliet sought treatment in several countries, including Australia, Switzerland and Germany. “Whatever happened, I would motivate myself to move on and be hopeful, having faith that scientists are researching new territories which will hopefully bring important discoveries that may be able to help me and others who have cancer,” Juliet says. After the two cycles of treatment at SPDT 4 LIFE, Juliet’s condition has improved considerably. In Australia, the only treatment her doctors offered her was chemotherapy. 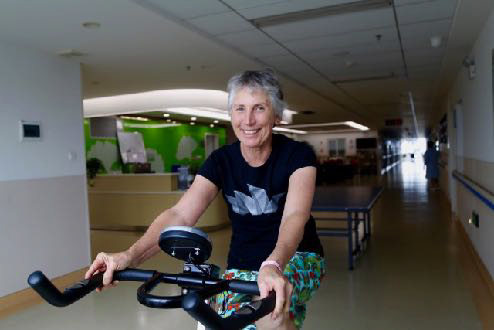 “I continued to search for new and better ways to battle my cancer which is how I discovered SPDT 4 LIFE at Golden Sand Bay Hospital in Guangzhou,” says Juliet. 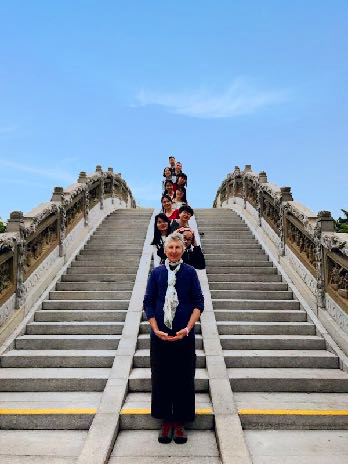 Although away from home to seek medical treatment in China, due to her improved condition Juliet is able to leave the hospital on the days she has no scheduled treatment. For those patients that are strong enough and have doctors permission, the team at SPDT 4 LIFE will plan excursions and events as part of the SPDT 4 LIFE Patient Welfare Program. These events are designed to boost morale, get the patients outside to feel the sun on their skin, take in some healthy vitamin D and to show them around the sights of Guangzhou. These happy and fun events have proven to be beneficial to patient’s overall attitude and health outcomes. For Juliet traveling to China for SPDT treatment was undoubtedly a very wise choice. After two rounds of treatment, Juliet’s tumor have not only been effectively controlled, they are shrinking. In addition SPDT has enhanced Juliet’s immune system.